Essential Shoulder Exercises | Valet. Justin Theroux clearly never skips shoulder day at the gym. The deltoids. Your shoulder muscles. They're small and often overlooked, but they're impactful. Just look at some of Hollywood's leading men—they don't have to be stacked, but almost all of them have decently developed delts. That's because working your shoulders broadens out your frame, which visually slims your waist and carves out that coveted V-shape. And since you've likely never properly pushed your shoulders like this, you'll notice muscle gains much quicker than anywhere else on your body. This works the front of your shoulders, as well as your pecs. Keep the weights low and the reps high to maintain form and see results. Stand straight holding a dumbbell in each hand in front of your thighs, with an overhand grip. Raise the left dumbbell out and upwards, keeping your elbow slightly bent, until your arm is a little above parallel to the floor. Slowly lower the dumbbell to the start position and repeat with your other arm. This move is named for its inventor—Mr. Universe, the Terminator himself, Arnold Schwarzenegger. 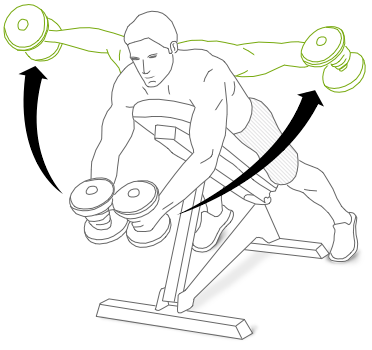 The rotating motion at the end of this exercise hits more than the standard press to fill out that V-shape. Grab dumbbells with an underhanded grip and elbows flexed, palms facing in towards your chest with dumbbells at or slightly below shoulder level. 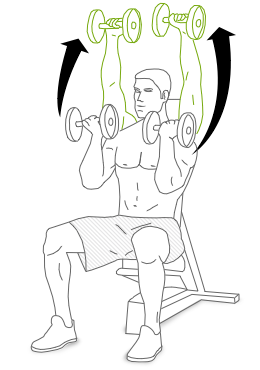 Raise overhead while rotating shoulders (turning thumbs inward). At the middle stage of the exercise, elbows should be at shoulder level and forming right angles with palms facing each other. At the top, palms are facing forward with elbows nearly locked. Lower back down along the same path. This variation on the more standard lateral raise will hit you where it hurts, working both your shoulders and back. Lying on the bench lets you focus more on the movement and less on stabilizing. Lie face down on an incline bench set at 45 degrees. Hold a dumbbell in each hand below you, palms facing each other. Keeping your arms slightly bent at the elbow, pull back with your shoulder blades until your upper arms are parallel with the floor. Then return to the start. The name deltoids comes from the Greek letter Delta, which is a triangle. The name refers to the triangular shape of the shoulder muscle. An efficient jump rope workout that works your legs and boosts your coordination. No reps, no sets. Just an effective exercise that'll make your clothes fit better.